Retro-Bit, the makers of the Retro Duo, have revealed details on their previously announced GBA clone system known as the Super Retro Boy. It will see a North American release some time in August of this year and will retail for $79.99 (USD I would assume). The system will play games off of Game Boy, Game Boy Color, and Game Boy Advance cartridges. There aren't too many Game Boy hardware clones out there, and some GBA clones (like the RevoK101 Plus) don't play GB/GBC games. Looks pretty cool to me, though I'm not sure how I feel about having the L and R buttons added in as face buttons above the A and B buttons. The Chibi-Robo! Zip Lash game and Amiibo bundle is on sale on EB Games and Amazon.ca for $15 Canadian. It's the best price I've seen it so far, even less than buying the Amiibo by itself (at least in Canada). *Edit: The bundle is no longer $15 on Amazon.ca as of April 22nd, 2016, but the sale is still on from EB Games. It's the 3rd and nobody made a pickups thread yet. Pokémon Sun and Pokémon Moon have now been officially announced for release on the 3DS worldwide this 2016 Holiday season. Recent European trademarks have revealed two potential new games in the Pokémon franchise, which can be found here and here. With tomorrow's Pokémon themed Nintendo Direct, these are a real possibility. Because these are only trademarks, we really don't know much else, other than that Nintendo was the company that filed them. Release dates, platform, etc. are all unconfirmed as of yet. This sold out pretty quick the first time, but it's been up now for a couple hours. A good chance to get one in case you missed out last time. This post is now meant to outline all upcoming and announced limited editions being offered by Limited Run Games. Much of the info featured in this post was found through LRG's forum, in addition to their Twitter account. When officially announced, release dates and times will be added to the entries in the "Upcoming Releases" section. The company "Limited Run Games" popped up recently and has promised to produce physical copies of games (so far for the PS Vita and PS4 and soon Switch) that were previously available only in a digital format. As the company's name suggests, these games will be produced in limited quantities which will depend on the game and will not be reprinted after they sell out. From what I've seen and read so far, the games will be individually numbered from 1 up to however many were printed. They don't appear to have ESRB ratings, and I'm not certain if they have bar codes or item numbers like the PS4 and Vita physical versions of Retro City Rampage DX. 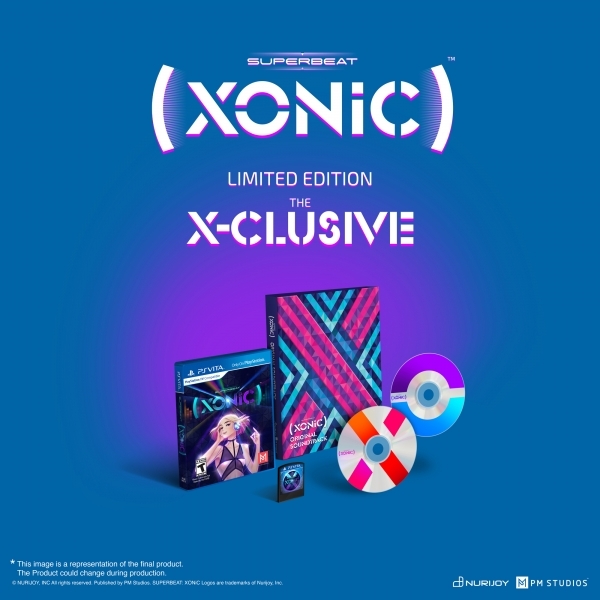 Superbeat: Xonic is getting two very limited editions. The first, the "X-clusive" edition, comes with a 2-disc sountrack (in addition to the game of course) and is limited to just 500 copies. 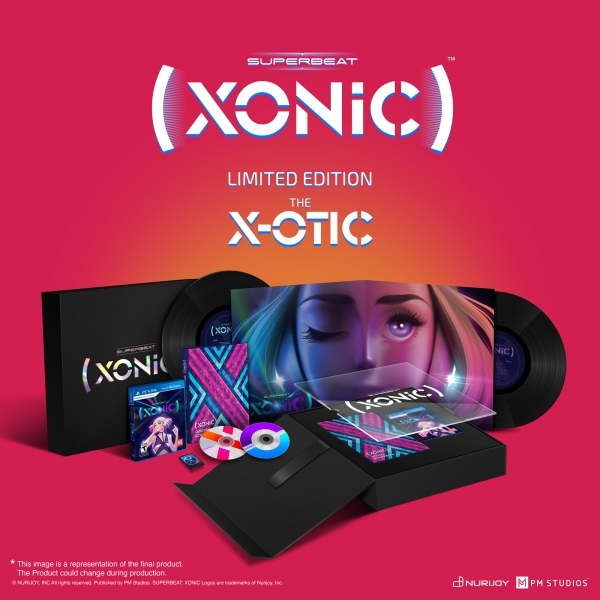 The second, the "X-otic" edition, comes with the same stuff in the "X-clusive" edition, but also comes with two LP records and an even fancier box. The "X-otic" edition is limited to 450 copies. The preorders go live today here at 4:00pm PST. The "X-clusive" edition will cost $50 plus $8 shipping, while the fancier "X-otic" edition will cost $100 plus $15 shipping. The PlayStation 4's update 3.00 launches tomorrow. Among the new features added is the ability to form "communities". Communities are very similar to Steam groups, to give you an idea what they're like. They have their own message boards, allow players to share screenshots with the group, and can start parties/groups for games. Would anyone here be interested in joining one for VGC and would one of our admins here with a PS4 be willing to create one for us? Capcom has announced that they will be releasing the Resident Evil Origins Collection in North America on January 19th (22nd for Europe) of 2016 for the PS4 and Xbone, which will include the HD ports/remakes of both Resident Evil and Resident Evil 0 on a retail disc! You can already buy Resident Evil's HD port digitally, and the digital version Resident Evil 0's HD port will release for the same consoles around the same time as the physical product (though I'm sure most of us here only care about the physical copy ). Resident Evil 0 is set to include a new "Wesker Mode" where you can play as Albert Wesker instead if you so desire. The physical collection will cost $39.99 at launch. Stealth Inc. 2: A Game of Clones - Humble Deluxe Edition is free on the Humble Store until August 31st (this Monday). Summon Night 5 for the PSP/PSVita is getting a one time physical release in advance of its digital debut, and we can finally reveal the full package you'll receive. 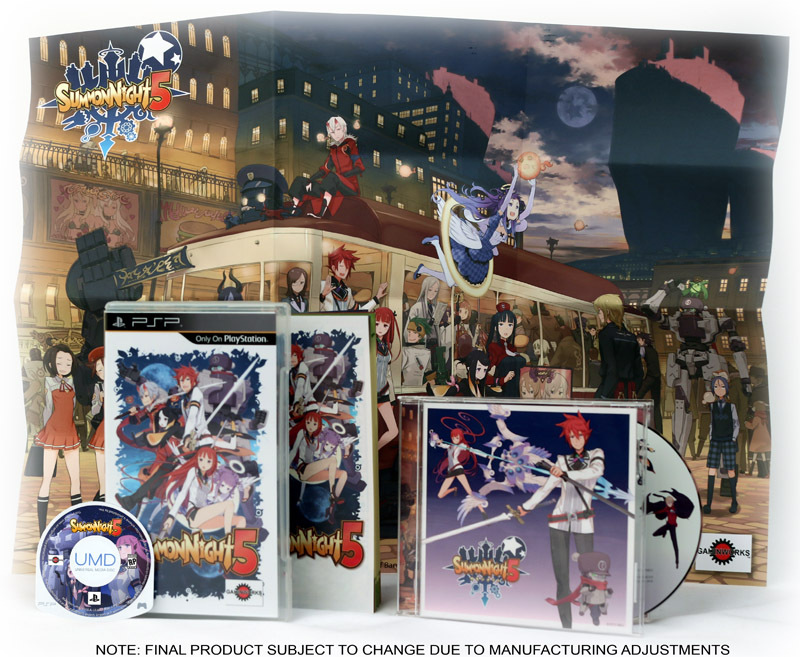 It will include the game case with multi-sided full-color insert, game UMD with full-color label, full-color game manual, one of two randomly inserted gigantic 14" x 19" posters, a serial numbered hologram, a digital download code to download the game from PSN free, and the last, and biggest addition: the FULL ORIGINAL SOUNDTRACK for the game, featuring all 37 music selections from the Japanese release of the OST in a full-size CD case with full-color inserts. Yep, back up. Read that again. You're welcome. And, thank YOU, too. YOUR SUPPORT made this inclusion possible! All that's only going to cost $41.99 + $5 shipping anywhere in the US. International shipping will be more. It's really nice that the physical version of the game will come with a code for the digital version too. The rest of the package is pretty awesome too. The presale for the physical version of the game opens up next week and will remain open until the end of August. Sooo... my Vita has been acting up lately and I'm not sure why. I've been frequently getting an error message from my Vita after putting it on standby for a while telling me not to remove the memory card while the system is on. After the message is shown, the system restarts itself, but if I put it on standby again I'll get the same error message. Of course, I haven't removed it or touched it at all while it's turned on. The only temporary fix I've found is to turn the system on without the memory card, then turn it off and reinsert the memory card and turn it on again to rebuild the system's database. After that, I don't see the error message again for a while. Recently, the fix doesn't seem to last long before I start getting the error message again. Have any of you here had similar troubles with your PS Vita? I'm really hoping that there's a more long term solution that I'm not aware of so I don't have to replace it or send it in for repairs. If you're wondering what I'm having issues with, I'm using a 1000 model PS Vita and a 32GB memory card. Sooo... after five or so years since the last Mega Man game (Mega Man 10, if I remember correctly), Capcom has announced that they're releasing the Mega Man Legacy Collection for the PS4, Xbone, PC, and 3DS. The console and PC versions are due to be released in NA and Europe this Summer, while the 3DS version is due for this Winter. The game will cost $14.99 on all platforms when it releases. Being a huge fan of the franchise, I was initially pretty excited, but that excitement has already worn off. From what I've read online and seen from the trailer, it's just ports of Mega Man up to Mega Man 6 with some added features like leaderboards and video replays, as well as an art gallery. The trailer mentions something about added "HD Flair", though I'm not sure what they mean by that, as the games clearly haven't been visually remade. Judging by the price point, it's very likely that it's also digital only. My impressions so far are that it's similar to the Mega Man Anniversary Collection, except worse. I'm unimpressed, though not particularly disappointed as I considered the franchise long dead since Mega Man Legends 3 was cancelled and Inafune left Crapcom back in 2011. Now that a recent leak has revealed that the game is to be released on November 17th for the PS4, Xbone, and PC it won't be too long before we finally get more Star Wars: Battlefront. What do you all think about it? Will it live up to its predecessors? Will it be plagued by poorly handled DLC like far too many modern games are? Or will EA handle DLC properly and support the game well into the future with plenty of new content for players? Similarly to the PS4 version, Fangamer has now brought us a physical PS Vita edition of the game. This one is $30 and is set to ship later this April. As with the PS4 version, it will be an official release (number PCSE-00630).